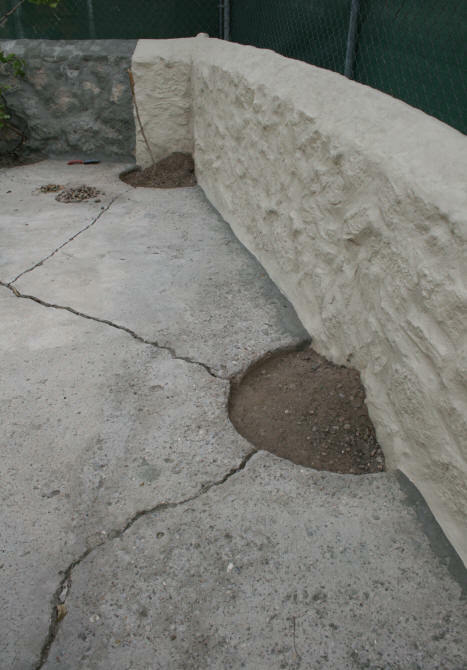 The patio between the two stucco walls on one side of the house and the garage has some very boring concrete and some damaged areas. 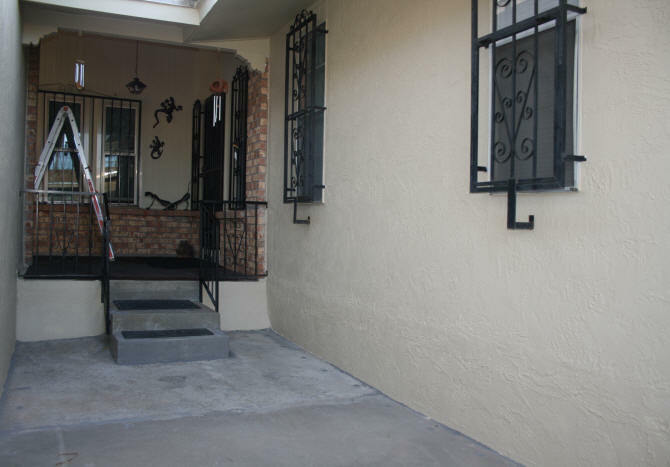 The two stucco walls in this area, which had some buckling damage, were just repaired and painted. 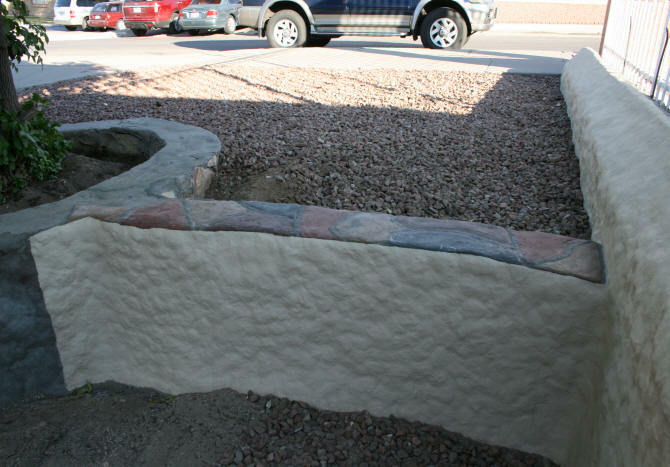 (Stucco repair covered on this page...) I had also repaired some big gaps between the stucco walls and the concrete patio. In addition, I filled a bunch of holes that had been drilled into the concrete during a termite inspection. At this point, I have sealed up any area on this patio where water could seep in underneath the concrete slabs. The plan is to create the look of a combination of fake tile and bricks. I researched different options like concrete overlay stamping which can be expensive. Just purchasing the concrete stampers/molds themselves can be very costly. Renting the stampers/molds is not an option in this town. Hiring a firm to do it, is even more expensive. The creator of this video used vinyl cement patch to create fake bricks and tiles for her front porch. I liked this option because on close inspection of the finished results, it looks real. This is because the faux brick and tile surface is slightly raised above the grout lines, like a real brick or tile surface is. I decided to try this option after viewing the video several times. I started with the wrought iron first, but realized that I would need to do the faux treatment on the stairs first, before I put on the newel covers on at the bottom of the stairs. So I stopped working on the wrought iron to work on these stairs. The cement on these stairs takes a beating from the rain which comes off the roof right on top of the stairs. So there was some damage to the stairs. Last year I had patched some corner areas where I was about to loose some big chunks of cement. The photo below shows some of the patched areas. The entire bottom stair needed to be repaired. Which I did first. There are some surface cracks and staining on the cement which I would cover up later with the vinyl concrete patch. I also wanted a rougher surface over this concrete. The concrete on these stairs is very slippery when wet. Which is why I had placed the rubber scroll mats on the stairs. Following the instructions on the video, I went to the hardware store to purchase the materials I would need. They had everything I needed except for the Terra Cotta Liquid Cement Color. I bought the Red, Charcoal, Buff, and Brown. 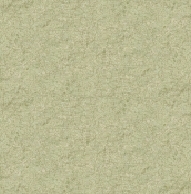 I figured with these colors, I could make the Terra Cotta color I wanted. 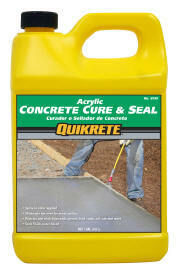 I purchased Quikrete Concrete Bonding Adhesive, Quikrete Vinyl Concrete Patcher, and Quikcrete Concrete Cure & Seal. The other item I needed was 1/2" masking tape. You won't find it at the hardware store. I ended up buying some online at Amazon. The first thing I needed to do before resurfacing the stairs was to apply the Concrete Bonding Adhesive. In the video, the "cement artist" diluted the bonding adhesive. I just used it full strength and applied it to the clean surface with a brush. 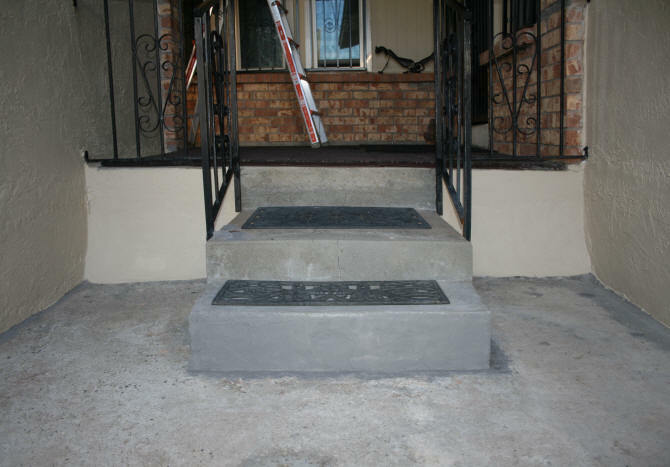 The next day I mixed the vinyl concrete patcher and resurfaced the stairs. Using this concrete patcher was problematic for me. It took me several batches to cover the entire stairs. The patch material dries in 30 minutes. I work very slow with my physical limitations. So I had to make only what I could work with within a 30 minute window. A note on the resurfacing I did. 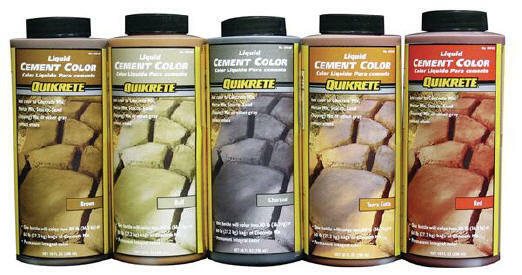 Quikrete actually recommends using their concrete resurfacer for this type of resurfacing. After reading about the materials online, the patcher was probably the best option for my stairs because of the vertical surfaces. The resurfacing material is a lot thinner and would not have stuck that well on my stairs. I will however, use the resurfacer on the rest of the patio. The patcher is just too difficult to work with over a large area. The next day, I placed the 1/2" tape on my resurfaced area to make my faux grout lines. I would be using two colors. 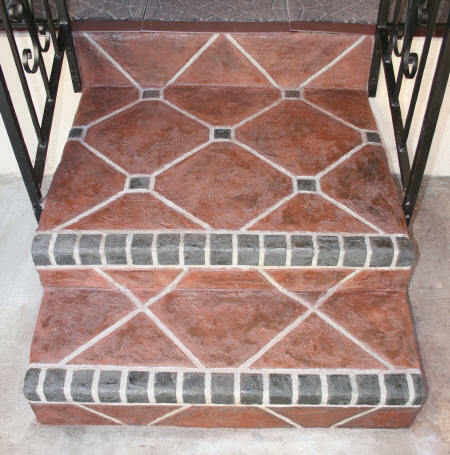 A blackish color for the stair edges and small tiles. 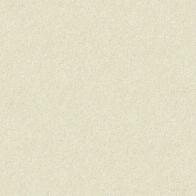 A terracotta color for the large tiles. 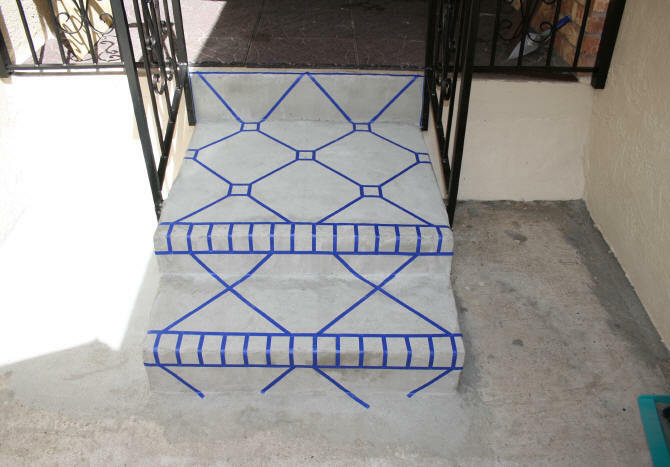 For my design, I wanted a different color to mark the edges of the stairs to make them more visible. I have always had problems going down stairs. The more visible the edges of the stairs, the better. I only used the small tile on the big step. I placed the blackish colored patch material on first. I had to let this patch dry first so I could cover it up. I forgot to get a picture of this stage. My apologies. I mixed a small batch of patch and used only the charcoal liquid cement color. 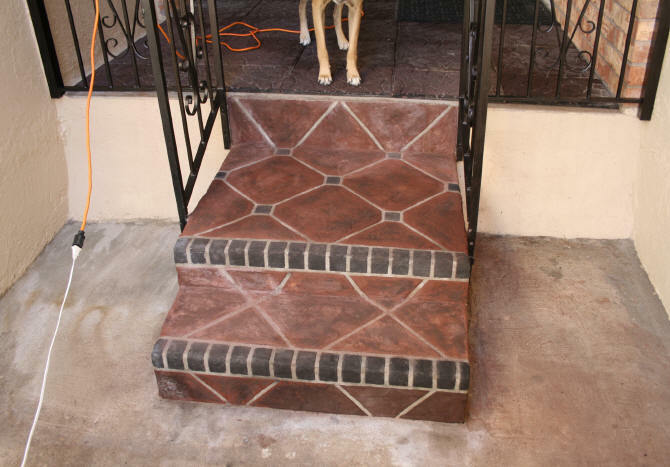 I then covered up the dark gray tiles and bricks on the end of the stairs so the terracotta color would not get on it. I cut small cardboard squares to cover the small tiles. For the terracotta colored tiles, I mixed one part brown, one part red, and one part charcoal and added it to my water. I needed to mix four separate batches for this stage. Letting different sections dry and with some rain interruptions, I finally finished this stage three days later. The photograph below shows the stairs before I did a little touching up. Several things had happened the past few days. Rain and the swamp cooler leaking. The white stuff on top of the faux tiles is from the water. I did put a huge plastic sheet over the area, but water still got in. Also, what bugged me a lot was where some of the cement color had seeped in underneath the tape. So my grout lines were a little murky looking and not the clean gray I wanted. To touch-up the grout lines, I rubbed a little bit of my DAP Vinyl Concrete Patch, that I had laying around, in the grout lines. I tried getting rid of the white calcium deposit with some vinegar, which did not help. What I did was mix a little of the cement color, red and brown, in water and painted it on top of the terracotta colored tiles. And before....any more rain came...I sealed the cement with the concrete cure & seal. 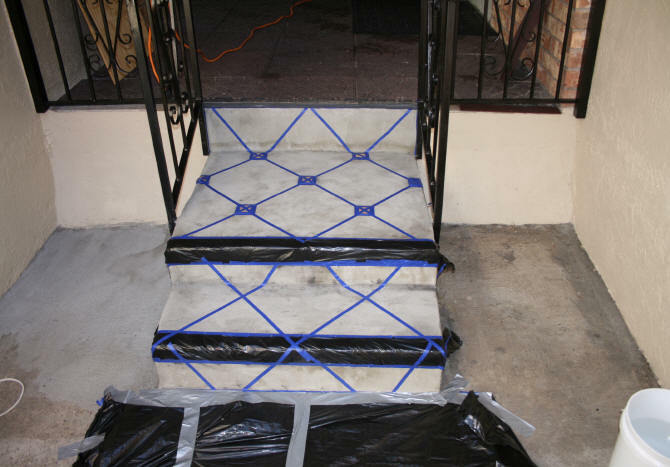 The photograph below shows the touched-up and sealed stairs. I used almost the whole 40lb bag on the stairs. I had plenty of the other items left over. A little less of the charcoal color which I used for both tile/brick colors. Was this project easy to do? Yes, in concept, but it was tedious and took me a long time. This type of resurfacing concrete is only for small areas. If you have a huge backyard patio, it would take you a long time unless you had help. For instance, someone to mix the next batch of concrete patch while one person is spreading a batch on the cement. There was some staining of the outer areas as seen above on the right. I did spill some of my bucket of water, which did not help. Since this area will eventually be resurfaced, I am not going to worry about it. The whole patio will be done at a later date and I will update this page. While working in the backyard on my rock wall repair project, I needed to do repairs around the stairs that are between the lower patio and a terraced area. 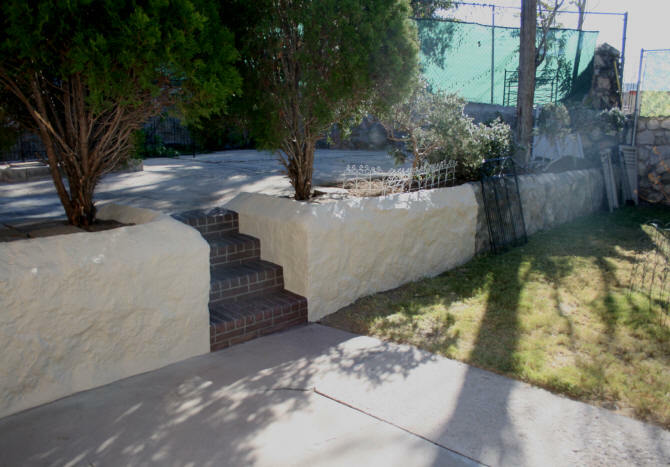 A retaining rock wall is on both sides of the stairs. 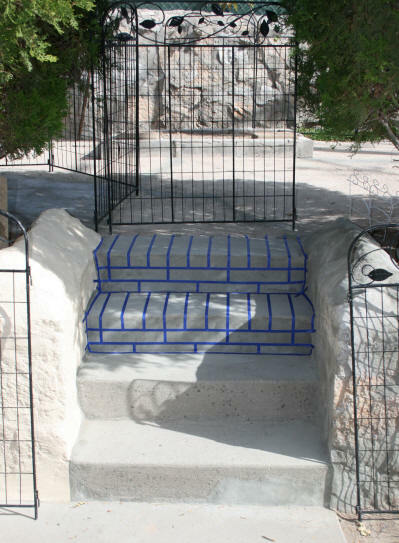 Since I am painting the rock walls after I repair them, I figured a stair face lift, like I did above, would work out great here. I have decided to make just faux bricks. 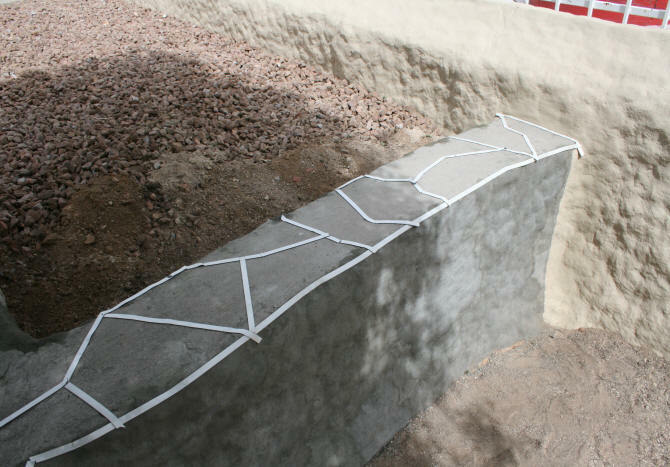 Since I made such a mess when I did the stucco patio stairs, I have decided to only work on just two stairs at a time. 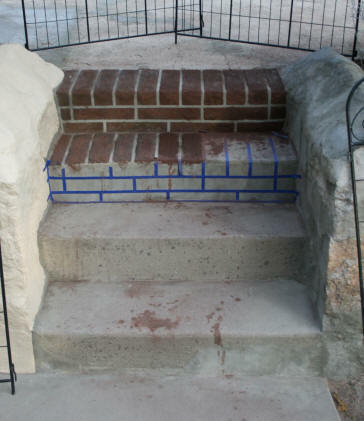 I resurfaced the top two stairs and then marked out my brick pattern with 1/2" masking tape the next day. 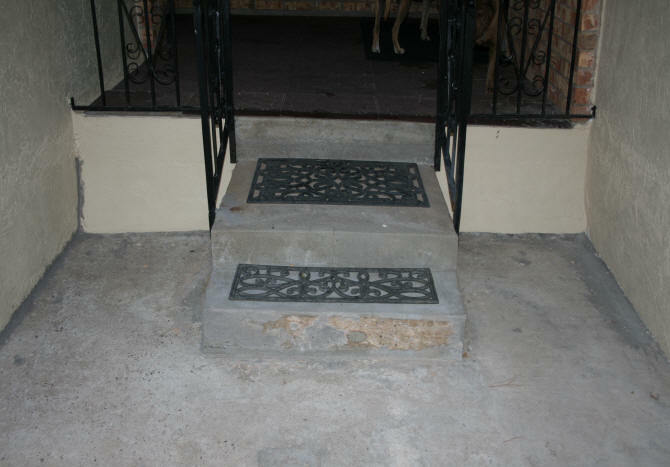 I then mixed the vinyl concrete patcher with the concrete color as I did above and applied it to the stairs. I mixed one part red, one part brown, and then added charcoal until I got a dark terracotta color. The photo to the right shows the work completed today. As I suspected I made a mess below the work area. Good thing I have not resurfaced the bottom two stairs yet. There were a couple days where the night temperature was below freezing, so work was halted. As soon as it warmed up, I continued on the stairs. 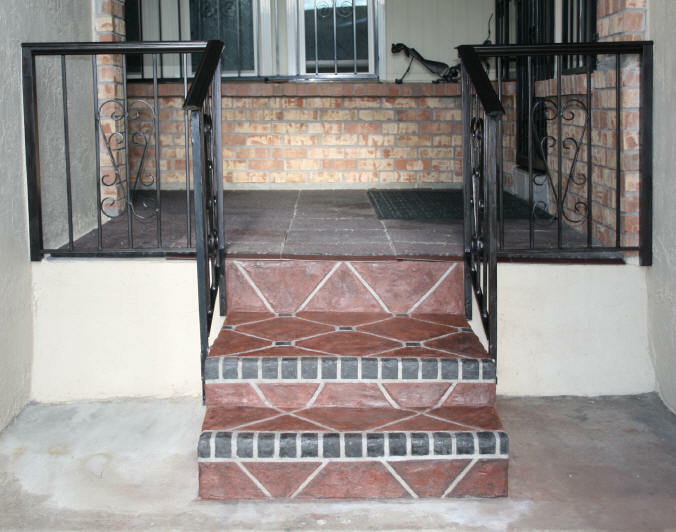 The photo below shows the completed faux brick stairs. I finished the second stair and resurfaced the third. The next day, I faux bricked the third stair and then resurfaced the fourth. The final day, I faux bricked the bottom stair. 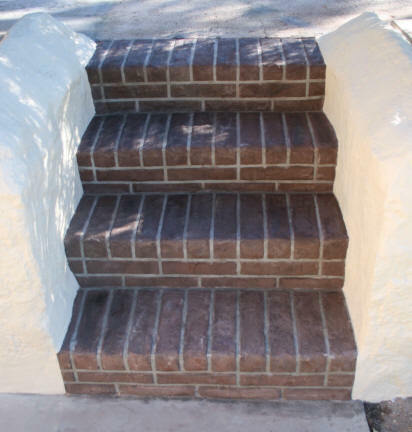 Work completed on Nov 21, 2014 After the final faux brick step cured for 24 hours I painted on the Quikrete Acrylic Cure & Seal. This placed a slight sheen on the "bricks" and darkened the grout lines. I am not particularly crazy about this but I do want to protect my work. The stairs came out exactly as I wanted them. A little rough and worn looking, like they have been there for a few years. The wall to the right of the stairs, which had been repaired, was painted up to the point where repairs were completed. I am now working on the rock wall on the terrace patio. 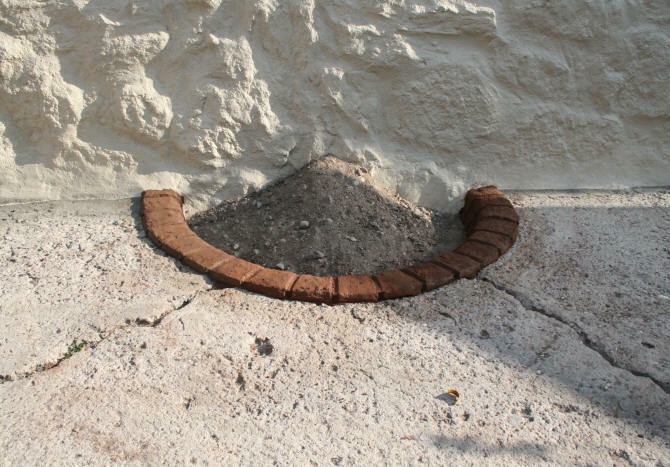 I needed to move the dirt in the terrace patio plant holes to do repairs to the wall. I have decided to do something with these boring holes while I am working with concrete. 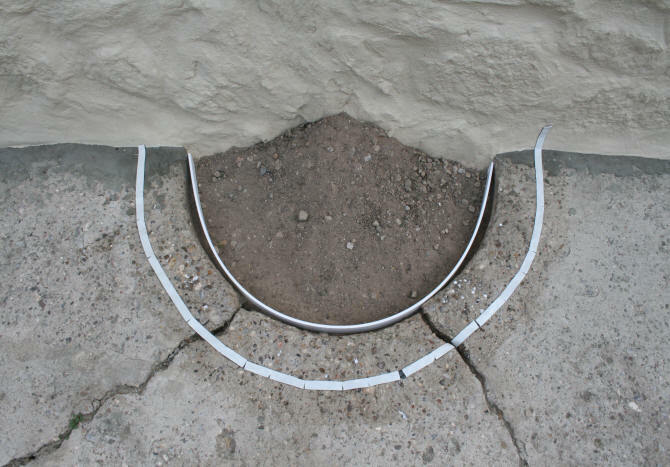 Besides the huge cracks in the patio and the spalled concrete, there are six plant holes along the perimeter of the wall. Two of the holes have no plants in them right now. Three of the six holes have grape vines, which I want to keep. My husband suggested filling in the unused holes with concrete. I have decided not to because it is easier to leave the holes as they are and plant something in them next spring. I have decided to do a faux brick treatment along the hole edges which will repair the damage around the rims and make them look a lot better. The first thing I did with the holes was to dig away all of the dirt so the edge was exposed down to the depth of the concrete slab. I then cleaned the cement around 6 inches out from the edge. 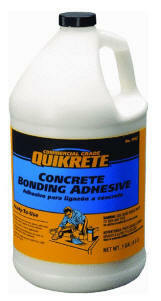 I then applied Quikrete Concrete Bonding Adhesive to the surface. When the Bonding Adhesive was dry, I then measured out 4 inches from the edge and made pencil marks. Instead of masking tape, which I used above, I used weather stripping instead. The kind that comes in big roles and is sticky on both sides. 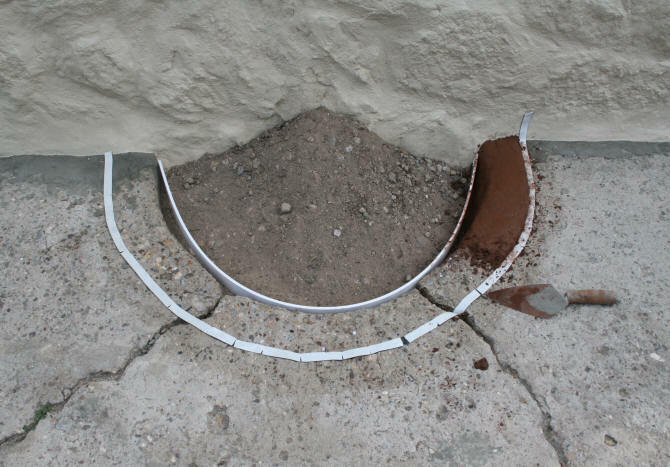 The weather stripping sticks better on a rough cement surface and prevents color bleeding. The weather stripping was placed around the hole at the 4 inch marks. I needed to make cuts on the outer edge of the weather stripping so it would go around the curves. I put a piece of PVC lattice moulding on the inside for a guide, but decided I did not need it. So I removed it after the first batch of cement. Weather stripping placed 4" from the edge. PVC moulding on the inside which I really did not need. For this faux brick project, I am going to work in reverse of the projects I did above. First I will make the faux bricks, then I will put the faux mortar in. The reason for this is because I want to make these brick edges higher than the existing surface. 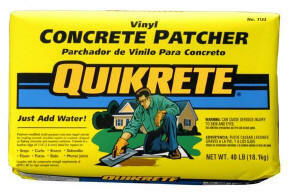 I will be using the same vinyl concrete patcher I used above. I used the Quikrete Terracotta and Brown cement colors. I needed to mix 4 small batches and made the bricks around the rim of the hole and down the inside edge. The brick edge will be about 3/4" above the surface. First batch of cement going on edge of hole. I removed that piece of PVC moulding after this batch. When the cement started to harden I cut into the cement my faux mortar lines. I just went around the edge and marked 3" for the bricks and 1/2" for the faux mortar lines. I removed the excess cement. I also used my gloved hand to remove any smooth trowel lines. I just placed my glove wherever it was smooth and dabbed the cement with my hand to make it look rougher looking. Where the cracks in the patio are, I filled them with the cement patcher before putting the the faux bricks on top. I finished one other hole before the end of the day. I will let the faux cement bricks set for a day before applying the faux mortar. December 15, 2014 - Three of the plant rings are finished. The other three I will work on when I finish the rock wall on the terrace patio. The faux mortar was added to the faux bricks. In addition to the plant holes, I also put some of the patch around the faux bricks. This is because I will be putting faux flagstone on this patio to repair the spalled and cracked patio. 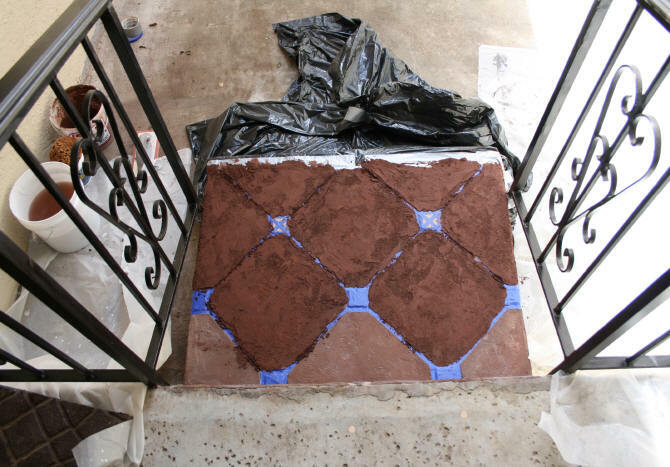 By placing the patch around the brick on the holes, I do not have to worry about it later when I do the faux flagstone in 2015 (I hope). In the section of the patio pictured below, I repaired all of the cracks and made two faux flagstone against the wall. The reason for this is the grape vine. When I worked on this section, I needed to pull the vine out of the way. 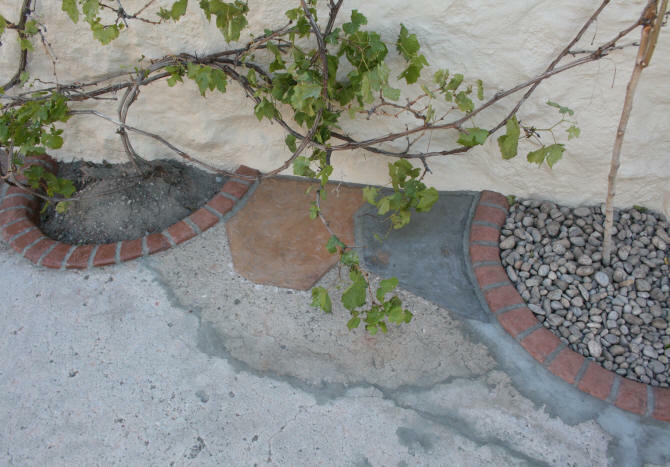 This way I don't have to move the vine when I get around to doing the whole patio with the faux flagstone. 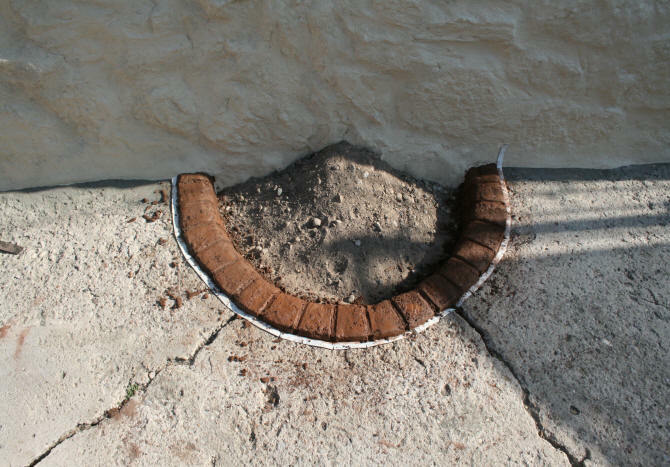 The faux flagstone was created the same way as the plant hole faux bricks. I marked out the area with the weather stripping, put the cement color in the water before mixing the cement, and spread out the dyed cement between the weather stripping. After removing the weather stripping, I put cement between the faux flagstone. Since I had already patched around the faux bricks, I did not have to put cement there. The flagstone on the left is Buff and the one on the right is Charcoal. Faux mortar added to faux bricks. Two faux flagstone added to patio between plant holes. 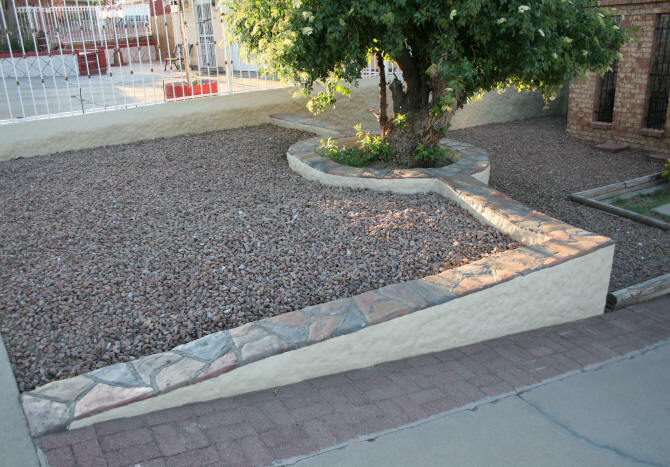 March 9, 2015 - While working on my rock walls in the front yard I decided to do a faux flagstone treatment to the cap of a small rock retaining wall. This wall is a distinctive feature in the front of the house and I wanted to make it "pop". The cement was in pretty good condition but there were several cracks. Some are small surface cracks. There are some big cracks around the section that circles the tree. The plan is to make the grout lines where the cracks are. If these cracks reappear, and I suspect that the big cracks will over time, all I have to do is just place some more cement in the grout line. I first cleaned off the top of the wall then marked with weather stripping the lines where the cracks were and then placed the rest of the grout lines randomly on this section. 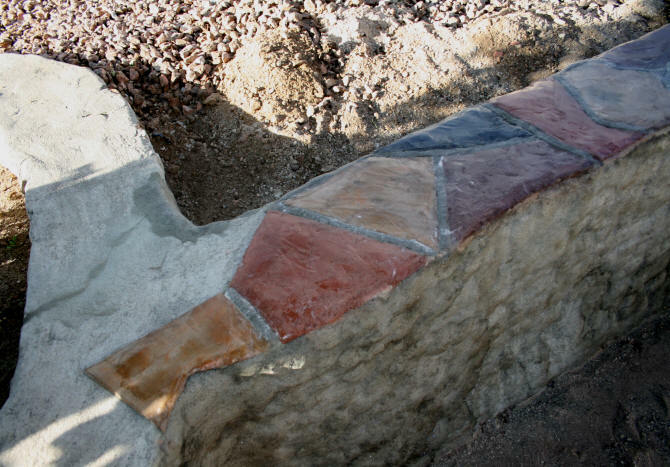 I then mixed each color of cement and with my trowel spread the colors in each section. I used 4 colors. Buff, Brown, Charcoal, and Terracotta. After the faux flagstone tile set, I removed the weather stripping and placed uncolored cement in the grout lines. This section of wall was then painted. How small section of wall looks after painting. This project was interrupted by the "Raising the Roof" project. I will add the photos of the finished project when I complete it. May 2, 2015 - I actually finished this wall about a month ago but did not have a good photograph until now. Folks who walk by like the "rocks" that I added to the top of the wall. They think they are real.